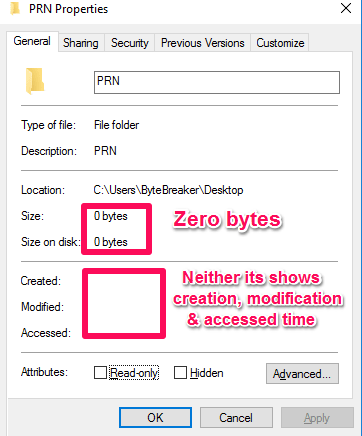 This trick not only helps you to hide all your secret files in zero bytes undeletable folder but users also can’t able to rename folder name neither its shows date and time of creation, modification & accessed time. This all can be done without using any software in windows, No need to download any folder lock to prevent data from others person. Sounds goods. Let’s go to step by step to achieve all this. Go to location where you want to create folder. Press Shift + right mouse click and select Open command window here from menu. 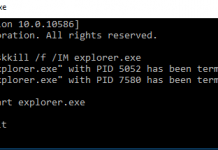 Type following command md PRN\ in Command prompt. This created zero bytes folder which is undeletable and unrenamable. Refresh the screen by pressing F5 key, if folder doesn’t appear on screen. Open this recently created undeletable folder and paste all the files you want to hide. Even after pasting all files, undeletable folder size remains zero bytes. Select all pasted file by pressing Ctrl + A. And then Press Alt + Enter or right-click and select properties. Select hidden option checkbox and then click on OK.
All the files will get hidden. If not follow the below steps. 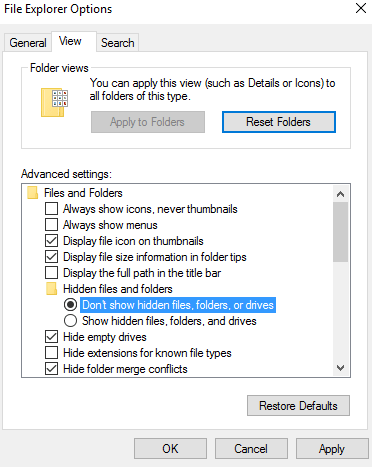 Search the File Explorer Options in the taskbar & select the first option. That’s it. All your files finally get hidden. 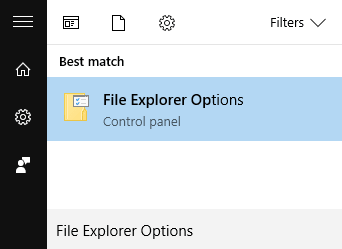 Search File Explorer Options in taskbar. That’s it. All your files get again visible. 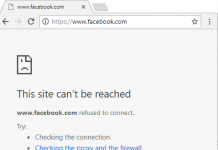 Yes, we can’t open the file by clicking. We can say as it a safety measure to prevent data from an unauthorized person. Copy and Paste the file into another directory (location). Press Shift + right mouse click and choose “Open command window here” from menu. That’s it. Folder will delete. 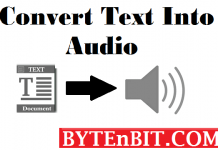 By following above steps user can create zero bytes undeletable folder. To ensure this all the steps are correctly performed. Check undeletable folder properties for all its information. After performing all above steps, Undeletable folder shows the 0 bytes size even after pasting the data. This trick completely hides all the information like creation, modification & accessed time. Sound off in the comments below. Let us know how this tricks working for you.